Nipped into Lowestoft today on shopping duties (if you can nip 20 miles) and well worth it it was too. Having popped in the bank I was crossing the road from the bus station, glanced to my left and did a double take Rowan Atkinson would have been proud of. There, on the 101's was B9 Gemini 37657. I managed to get a quick snap of it just as it was leaving but can anyone tell me how often a decker is seen on that route? First one I've seen. Whilst in Lowestoft I also saw Norse's Enviro 300 on the 107 for the first time - quite a contrast from the 29 seater Darts formally on that route - the E300 is high density seating - 5 across so must seat at least 70 I would guess. And glory be just after snapping that in came 33423 on an X1. I wonder if that bus will ever end up back at Yarmouth! Finally, I also managed to do some enthusiast spotting and standing by me when the above pic was taken was Zac Nelson of Norwich Bus Page. Pleasure to meet you at last, Zac and hope we'll have longer to chew the cud next time. As this Blog only started a couple of months ago there really isn't much to review, so this will be my own personal memories together with some of my favourite pics of the year. 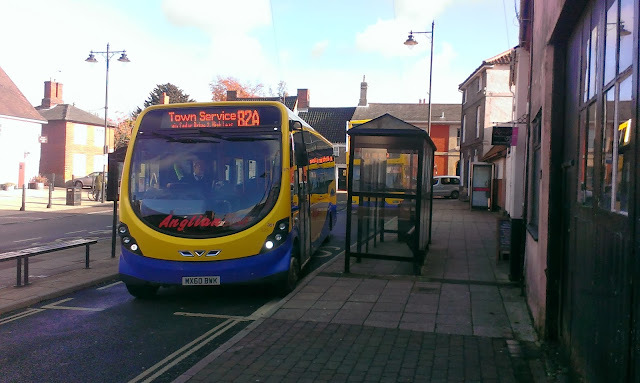 2013 started with me, as well as a few dedicated others trying to convince the good people of Wickham Market to switch from First to Anglian's 164 service. We were succeeding too, but were hampered by the coldest winter in 50 years and Anglian's reluctance to give the service enough of a chance and make the necessary alterations to the service which would have made it nore attractive. However, the six months it ran gave me a few decent photo opportunities. 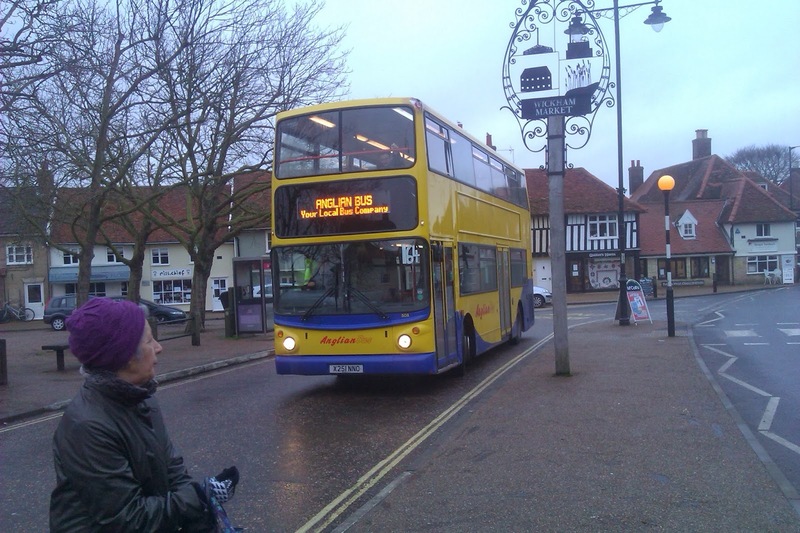 Now departed Anglian 508 ALX400 X251NNO at a cold Wickham Market, the only decker to ever operate that route. 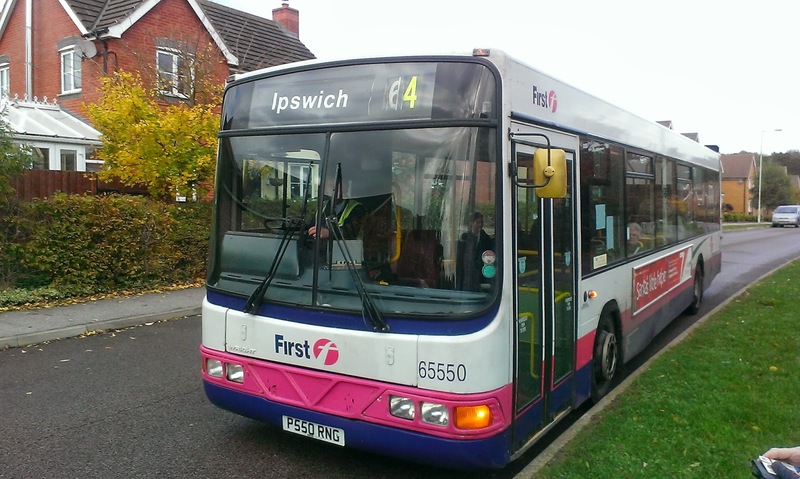 Wickham Market suffered a double whammy with First's decision to withdraw the 63 from Ipswich to Framlingham. 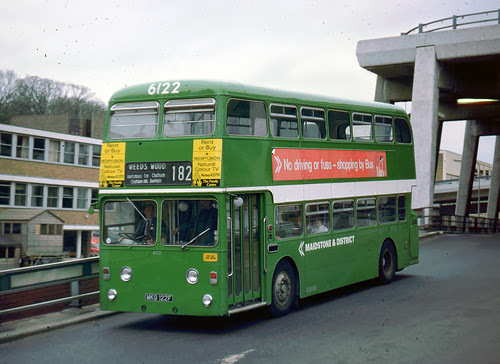 Not only did it leave us without a bus link to Tesco but also the 64's overcrowded and no guaranteed decker back from Ipswich that I always used to catch. Anyway although taken in 2012 this was my favourite bus to operate the route. On the fleet front Ipswich finally got rid of their last Darts but replaced them with some really awful ex Basildon Scanias that have been nothing but trouble. Also gone are the batch of Scanias with the really comfortable seats bought new for the Superoute 88. A shame to see them go. 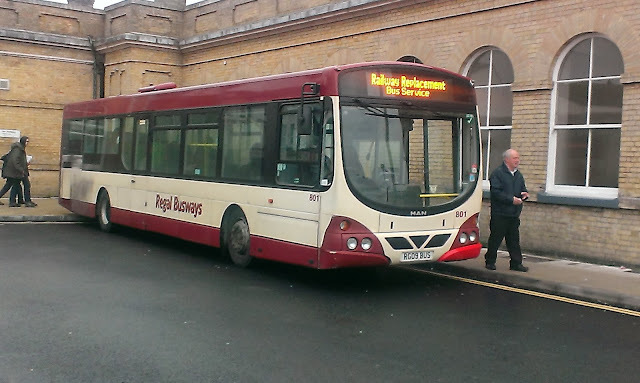 It will be interesting to see if the remaining 11 former P&R B7's stay at Ipswich throughout 2014. In July 2013 I was forced to move from Wickham Market and ended up in a village with no bus service - well nothing with a destination display or automatic doors anyway, which isn't that good for a bus enthusiast! 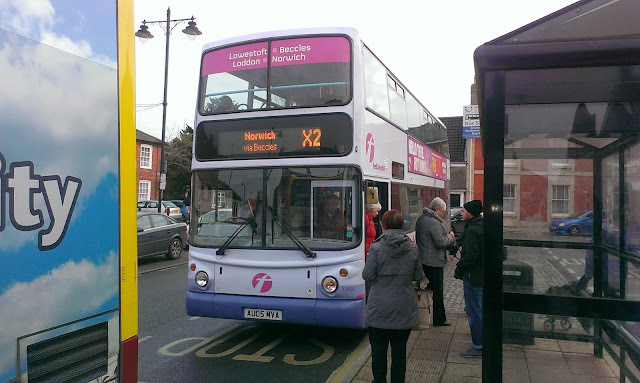 But it did give me the opportunity to finally explore the bus networks of North East Suffolk and Norfolk and a whole new world was opened up. 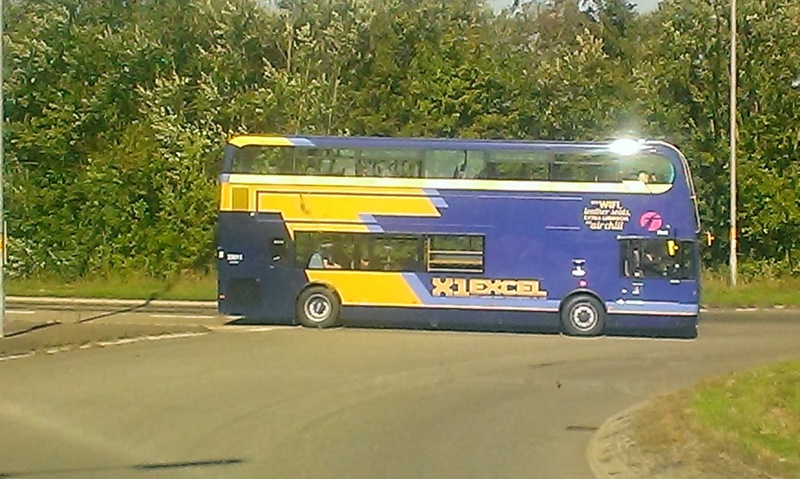 I discovered the X1, even getting to Rutland Water and back in a day from Beccles, and of course sampled my first gas buses, which I believe to be the nicest single deck buses ever built. 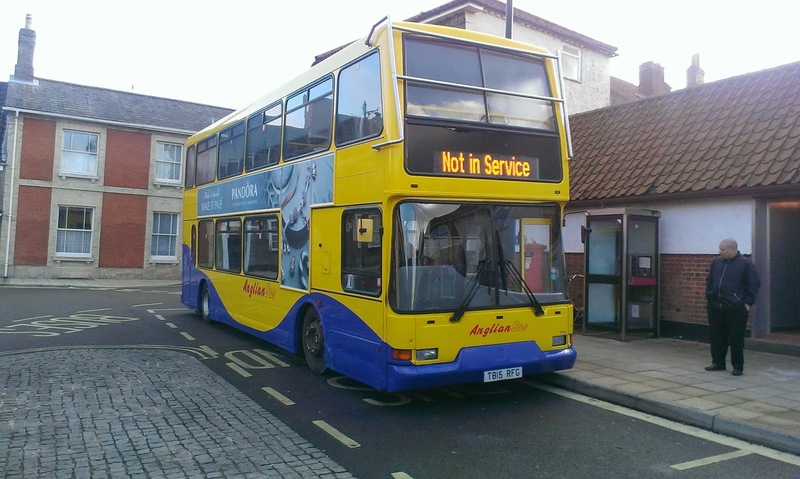 Now we have the ex X1 B9's appearing on Yarmouth and Lowestoft routes which is meaning the demise of the much loved Olympians. It will be a real shame to see these workhorses finally retired, and the end of an era. And so to my awards of the year - just a bit of fun and I don't expect anyone to agree with me, but feel free to add your own in the comments section. I guess this is no contest and purely for the excitement and interest it created this year it has to be the X1. It could be another interesting year for this flagship route as Stagecoach muscle in on the area. Let's all hope the X1 remains intact in itrs entirety this time next year. A very difficult decision this - there are many reasons to give it to First - getting rid of the Darts from Ipswich, welcoming me into their depot for a chat, and giving Cameron his year's pass. But I'm giving it to Carters. Ok call the nurses I know but any company that gives me the opportunity to travel in service on a 1985 ex London Transport Leyland Olympian deep into the Suffolk countryside gets my vote. One of the journeys I'll remember with extreme fondness this year. 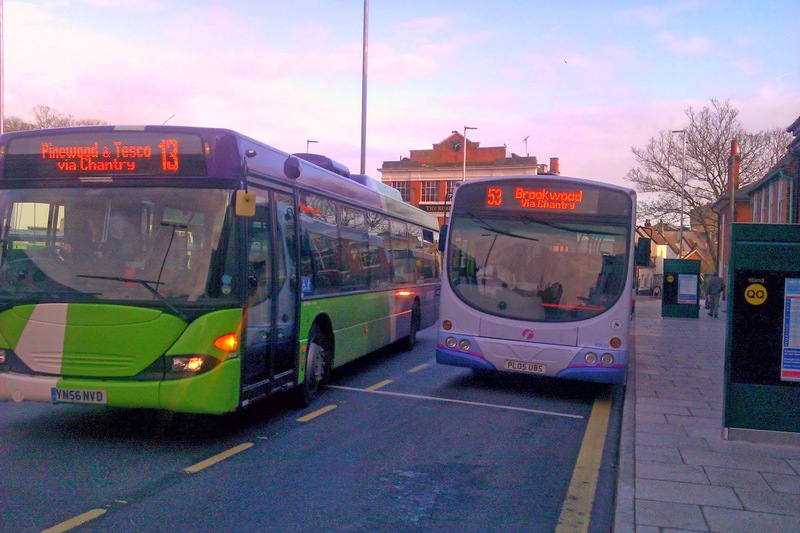 Anglian's decision to axe the 164 after just 6 months, using the worst winter for 50 years to base their judgement on, just as loadings were getting bigger and the route really catching on. Had the route been marketed bertter from the start it could and should have been a great success and it was disappointing that it wasn't given a real chance - the excellent drivers on the route deserved that. No contest. 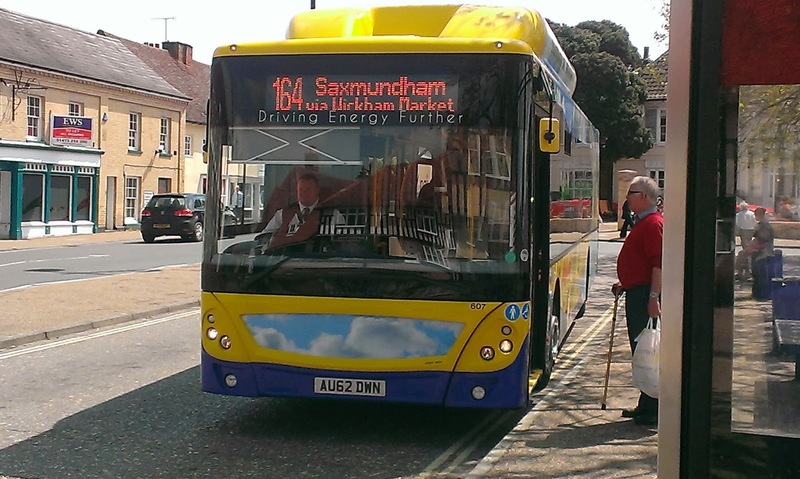 I was at Market Gates in Yarmouth when Sam of Norwich Buses saw his first X1 Enviro 400. Never to be forgotten and so heart warming to see the next generation iof enthusiasts enjoying their hobby as much as I did at their age. Thanks, for that moment, Sam - I'm proud to know you. Again a toughie. This year apart from the new buses in our area - the E400's and gas buses - I have been on a few old workhorses who have really stayed the distance well. I have also been on hybrids, which I'm sure will become more common this coming year. 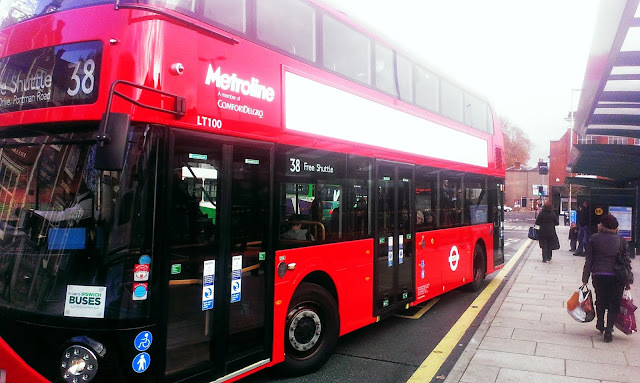 But my award goes to the Borismaster. This won't be the most popular decision I know but the designers have managed to capture Routemaster spirit with modern requirements and features and I loved the one that came to Ipswich. 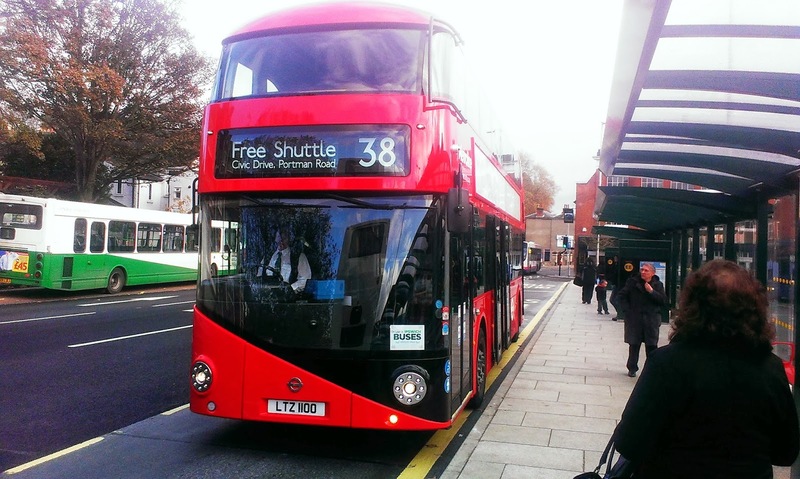 I really think it is the bus of the future and I'll be amazed if other parts of the country don't adopt it. Plus it means conductors are making a comeback and that has to be applauded. This is the Bus AND Train page so I have to have a train of the year. 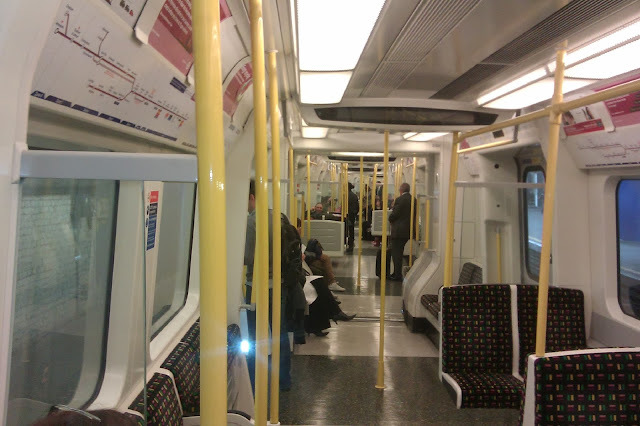 For me no contest again - it's the new train for the Metropolitan Line on London Underground. Not much makes me go wow these days, but when I walked onto that train, and realised I could see and walk right through it as if there were no joins at all I was seriously impressed. Quiet, smooth and fast. I don't like change but these are excellent trains and I can't wait for them to be rolled out on the Circle and District Lines too. A pic I took below. May I wish you all a Happy New Year. To my fellow bloggers a good year's blogging lies ahead, and I'm ;pleased to be getting to know you all. Who knows what we'll be talking about this time next year. May I take this oppportunity to wish all of you a Happy Christmas and a brilliant New Year. Thank you all for reading my blog and making it worthwhile. 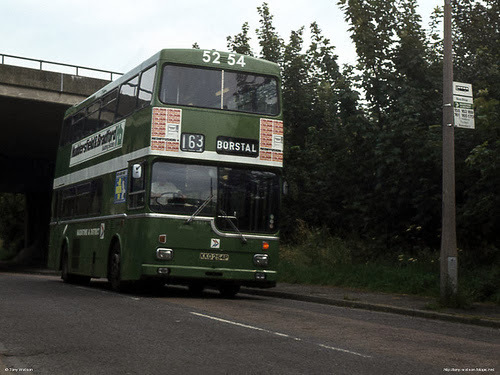 Lets hope 2014 has lots to keep us interested and it wouldn't surprise me if the bus scene in East Anglia this time next year is a lot different to how it is now. Have a good one everyone. I would just like to say a particular Happy Christmas to First at Great Yarmouth. For his constant enthusiasm, interest and his blog, First have given Cameron of Yarmouth Bus Page a nationwide pass for the year. I personally think this is a really kind thing to do and full marks to the management at great yarmouth. I am normally quick to criticise First but this gesture touched me and I know Cameron thinks all his Christmases have turned up at once. Just seen a post on Yahoo groups saying that Norfolk Green have been purchased by Stagecoach. Although not official it is "common knowledge in Kings Lynn". 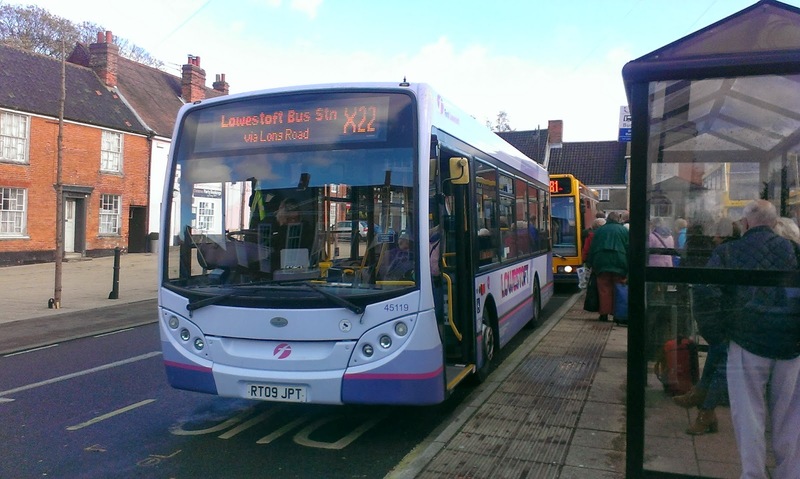 Not only that but Stagecoach have apparently expressed interest in First's X1 between Lowestoft and Peterborough, Whether they are interested in taking it over or competing against it has to be seen, but just when we all thought everything had quietened down the speculation and interest will build again. Really quiet on the bus front at the moment so apologies for the lack of posts. Anyway I went to Lowestoft today - no not for another hat - and took the opportunity to photograph the two Regal buses operating the rail replacement service between Lowestoft and Beccles. According to the notice on the station door trains are expected to resume on Wednesday (18th) so only one more day for Regal. Rear of Regal 802. Just liked the train symbol! I also saw First 20515 returning to Lowestoft on an X2. 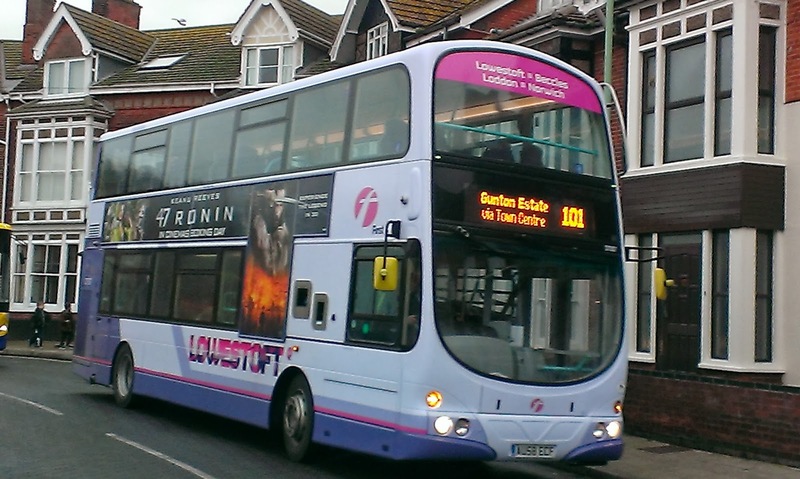 Was hoping to get a better pic on its next journey but it was replaced with 30900 so this will have to do. Note the rather shoddy X2 bit of paper in the windscreen. Not a lot to report so far this week, despite being out the last two days. 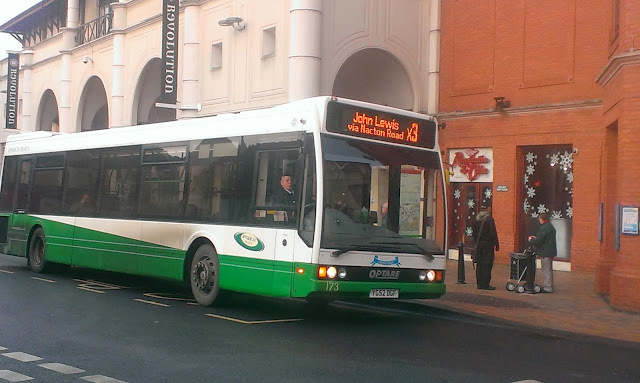 Yesterday I went to Ipswich in a fruitless attempt to spot and photo 32655. 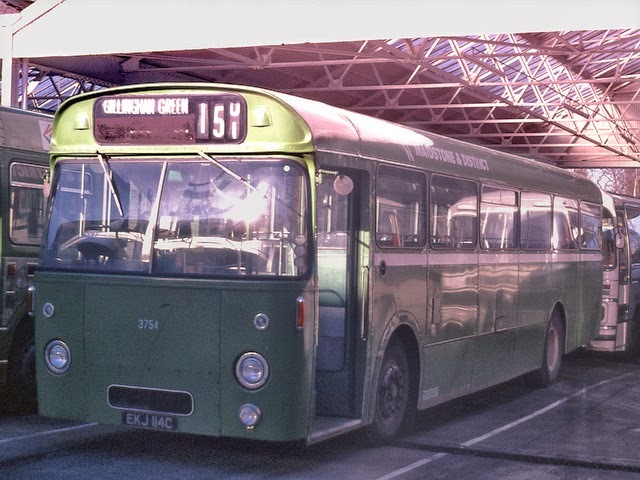 I was lucky enough to bump into Clive Nixon from Ipswich Bus Blog who told me she was at the depot but to be honest I just couldn't be bothered! I want an action shot so to speak! 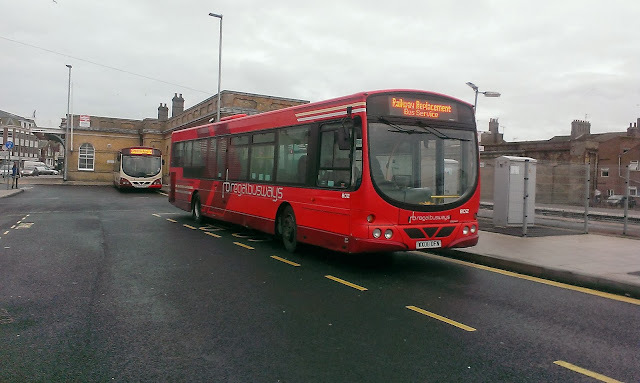 So other than spotting an unusual working by Ipswich Buses Optare Excel 173 on the X3, which is usually a branded smaller Dart not much going on there. 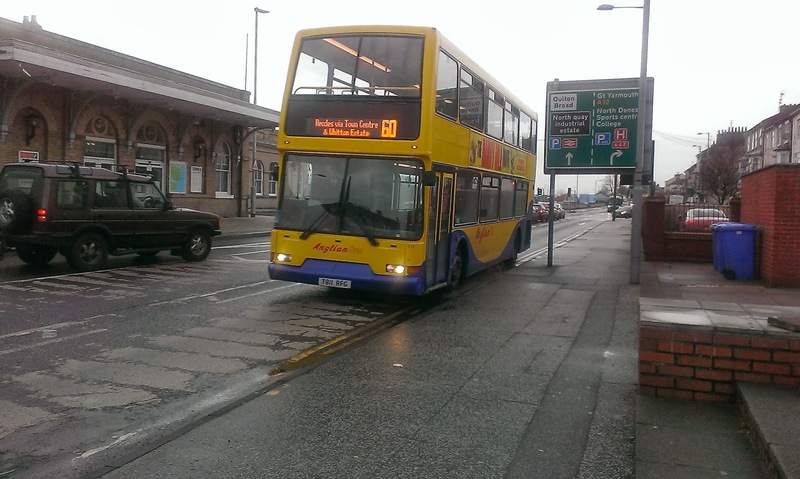 Today I ventured to Lowestoft to replace the woolly hat I left on 69007 yesterday - that's 3 so far this winter. Lowestoft has cheap woolly hats! Anyway a pleasant journey on Anglian gas bus 100 - although if anyone from Anglian is reading this when in the name of all that's Holy is the rattling nearside window going to be fixed? Pointless having a quiet engine if the windows make a row and that one has been for some months now. Although I didn't get a chance to take a pic 100 has also had a new front put on after someone kindly reversed into it recently. It looks strange minus the decoration and fleet number so if anyone gets a chance to take a pic of it that will be good. Not a lot to report from Lowestoft except the successful acquisition of a new hat, so I decided to go back to Halesworth the long way round via Southwold. 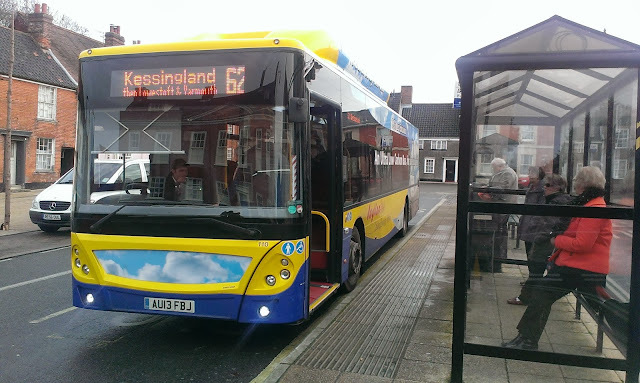 If you believe that you'll believe anything as I just got the times wrong and missed the 61 that becomes the 62 at Kessingland. Very embarrassing for an enthusiast. 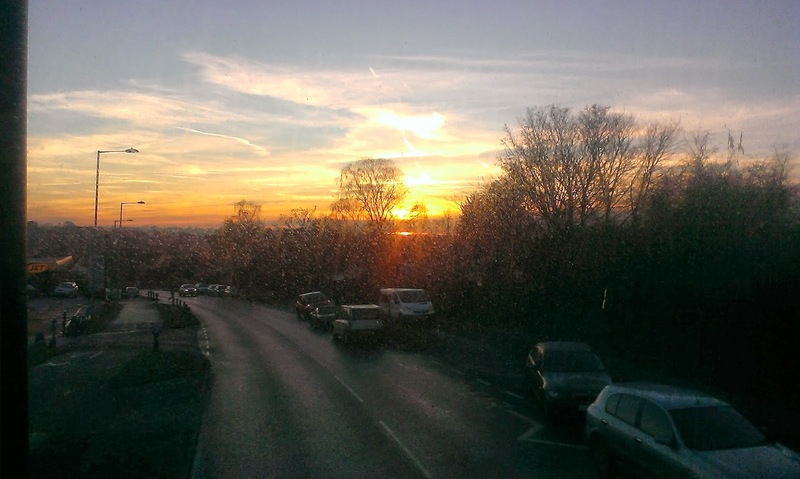 However on the way back from Southwold on Scania Omni 553 I did get the chance to take a couple of pretty nice sunset shots. Not buses but taken from a bus therefore qualifies as relevant!! Now for my rant. Over the last couple of days I have noticed an increasing amount of passengers, normally women in 50's and 60's who sit on the outside seat, put their bags on the inside seat and refuse point blank to move them so other people can sit down. I have had to watch much older passengers go a lot further down the bus than they should just because these selfish people, who in most cases haven't paid for one seat let alone two can't be bothered to make room!! Let's hear what gets on your goat about bus travel - after all any enthusiast will admit it's not perfect. It's been sometime since I last posted on my boyhood days so here is the next installment. I guess the day I started secondary school was THE day as it was the start of my unaccompanied bus travel - 2 buses each way to school everyday in the most interesting area for buses in the country. 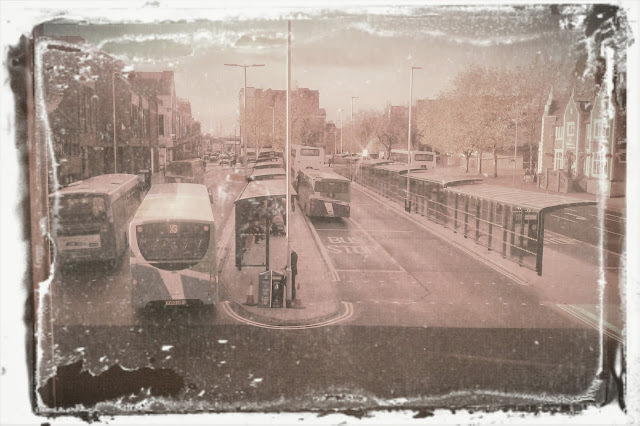 I was so lucky in that National Bus Company used the Medway Towns as their testing ground and so I was subjected to a multitude of wonderful vehicles to choose from. Here is a selection of vehicles that were around when I was 11. Manual AEC Reliance 3754 EKJ 114C. I have to say at this point that if God gave me a chance to ride one vehicle from my past it would be the above Metro Scania. I still consider them the nicest deckers ever built and I remember when 5254 had a new engine fitted - they only had two gears but this one didn't go into top until it was dooing 40mph and flew! 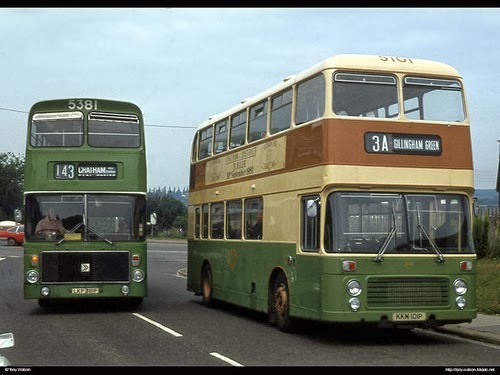 Of all the vehicles i rode in my childhood I never got a bigger buzz as when one of those turned up. Incidentally there is still a Young Offenders Prison at the site of the original Borstal, which took its name from the village. Went to Ipswich yesterday hoping to see 32655 not even knowing if she's there yet! Anyway I didn't see her and it was a bit cold to hang around taking pics but did get the opportunity to take a pic of this Carters Volvo. Now your assignment is to tell me its history. I have something lurking at the back of my mind that says Stagecoach but not sure. Answers in comments please and a gold star to the best answer! I am delighted to announce that 3 new blogs are here - one already born, one getting a new look and a brand new one from tomorrow. Harry Stanley has started his own Norfolk Transport Page. Harry often provides me with news about bus and rail happenings and I wish him all the luck with his own venture. Let me know if there's anything I can do, buddy. 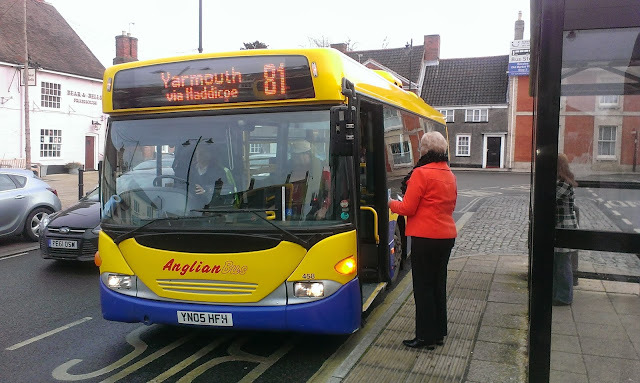 Cameron is giving his Yarmouth Bus Page a spot of DIY and the new look blog will be launched at 7pm tomorrow (5th Dec). Good luck with it , Cameron- I know you're pretty excited about the launch and your new look. Sam, who has done great stuff with Norwich Bus Page is embarking on his solo career with Norwich Buses, which will also be launched tomorrow at 7pm. A link to Sam's blog will be available as soon as I get the URL. Please give these guys your support. 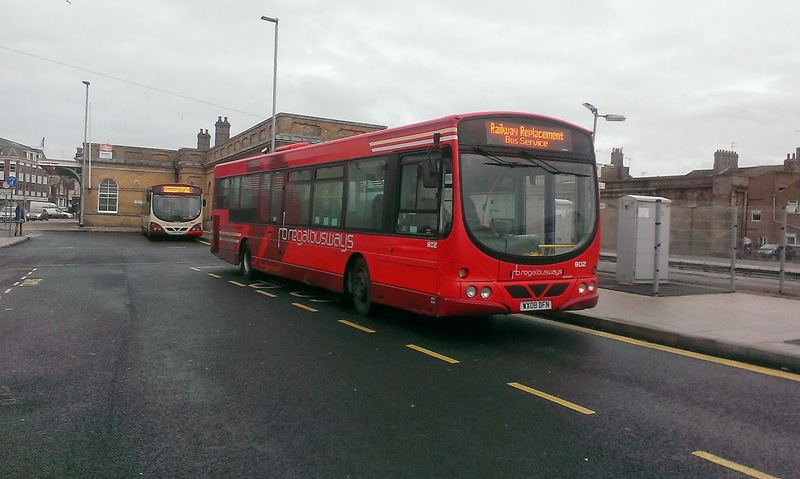 The more publicity and following the bus industry gets the better, and I know the industry is taking more and more notice of enthusiasts and their extensive knowledge. Sam and Cameron were the inspiration for this blog, and lads you are welcome to use any pics or news you see on here with my blessing - just give a credit. It's not easy finding new and original stuff for a blog, and we should all give these boys every help and encouragement possible - they are the future of bus enthusiasm and seeing their passion and dedication takes me back to when I was their age. It's a privilage to know both of you. I was fortunate enough today to be given time for a chat by Barry Spurling, Depot Engineering Manager at First Ipswich. As a result I am able to clear up and clarify a few things. 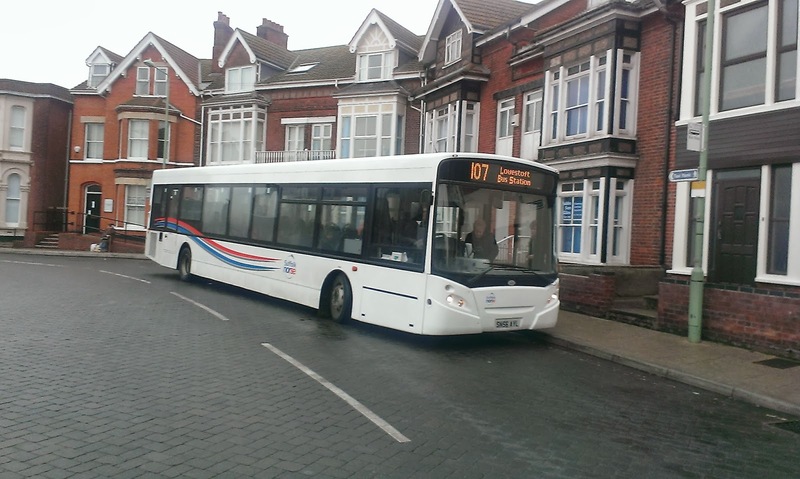 Volvo B7tl 32656 has arrived from Lowestoft and is in service (pic below). Sister 32655 is due tomorrow. There has been speculation regarding the future of 30887, even rumours saying she would go back to Lowestoft for a bit. This is NOT happening, and she will be transferred to Braintree in the next 2 - 3 weeks. The reason she is going is that she is too tall for the Ipswich washer - the reason Ipswich never got any of the ex X1 Geminis. On the single deck front I can confirm that ex P&R Volvo B7rle's 69421 and 69430 have gone to Colchester as part of the arrangement for 32655/6 going to Ipswich. 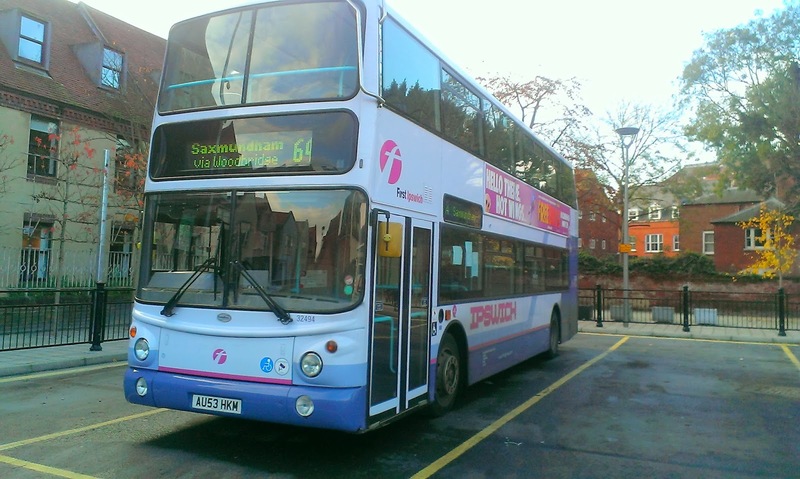 Scania Hard Seat 65676 has also gone to Clacton, and the next saloon to be withdrawn will be 61533. One of the ex Basildon Scanias currently VOR will be pressed back into service but that is it for the time being. No more transfers in or out are planned in the near future. 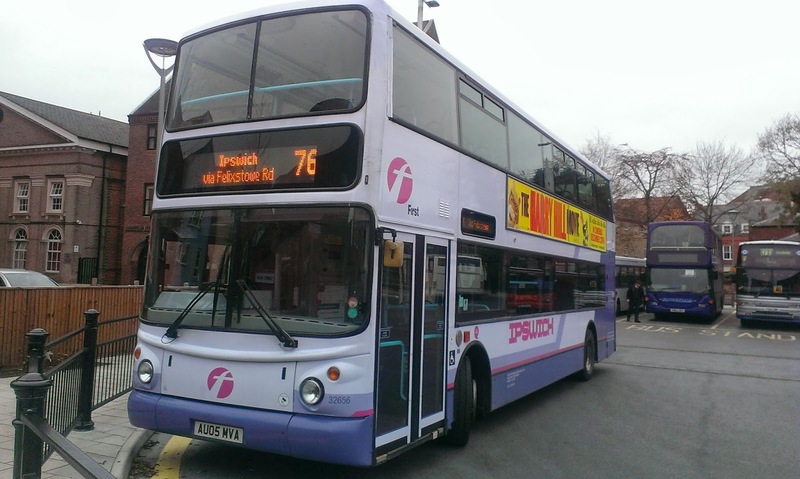 It is hoped to start repainting the B7tl's next once all the ex P&R B7rle's are complete - only one more to go now. 69432 is now out of it's co-op wrap and it was out on the road today for the first time in new colours. Thanks to Mr Spurling for the tip off and fate for having it standing there about to depart when I returned from the depot! (pic below). Those who think First are on the verge of pulling out of Ipswich can rest assured that is not the case. Mr Spurling didn't say it in these words, so I am not quoting him, but I get the impression First want a firm foothold on as many of the town routes as they can over the next 4 - 5 years, so that when Ipswich buses are eventually and inevitably sold off by the Borough Council First will be in a strong position. Could be an interesting future. I would like to thank Mr Spurling for his kindness in giving his time spontaneously today. Not only does he clearly know the business but he is a really nice bloke too and I've known a few grumpy Depot Managers in my time!! And so to today's pics. Pride of place has to go to 32656 which not 72 hours previously I had photographed in Beccles (see post below) and now here she is having gone up market and been to Felixstowe this morning! AND FINALLY something that made my day complete. Being Tuesday, Fareline's service 121 from Stradbroke was in town, using their rather striking Volvo B10M, but just look at the ticket machine - it's an old Setright. I owned a predecimal Setright when I was around 13 and if anyone knows of another operator that uses them then let me know!! Went out for a quick ride today and got a couple of previously uncharted routes under my belt. First of all drove to Halesworth and caught the 62 to Beccles and my word if you haven't been on it do it!! The narrow country lanes it meanders down are incredible and it really must take seom learning. The driver of gas bus 110 gave a exemplary ride. I then switched to Omnicity 458 on the 81 to Yarmouth, and again it's a really nice route I want to do again. 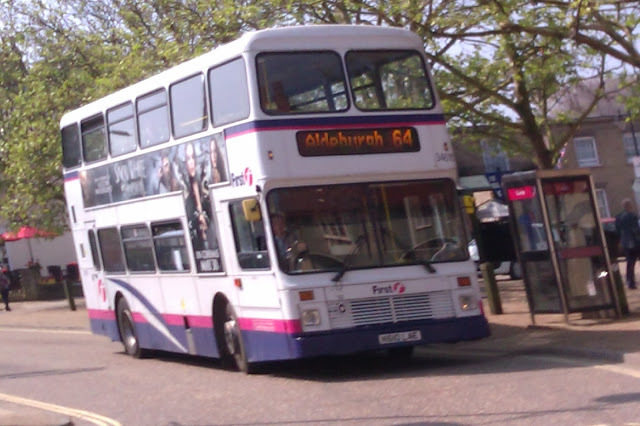 After lunch I took 37577 to Norwich on the X1 where I can report that all the X1 shorts were operated by Geminis - the first time I have seen that - and then got on Anglian Omnilink 453 back to Halesworth. No gas buses on the 88 today - any reason for that? Those Omnilinks are ok but seats are a bit hard for an hour and a quarter! 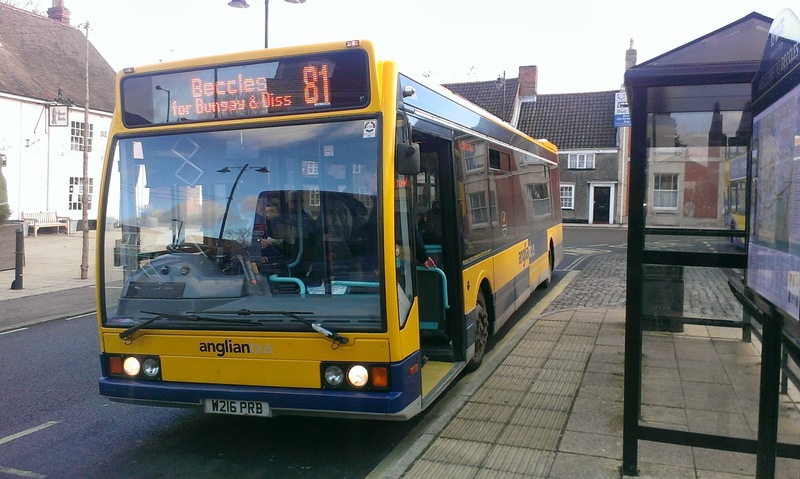 Incidentally after the changes Anglian are making in January it will once again be possible to travel from Beccles to Norwich with Anglian on one bus. That's the good news. 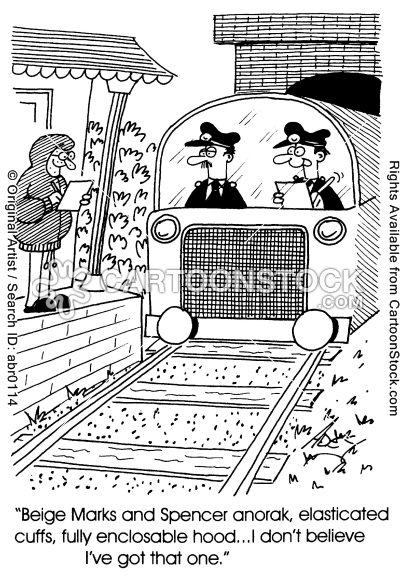 The bad news is you will have to go via Halesworth, Kessingland, Lowestoft and Yarmouth. By time you reach Norwich you'll have forgotten why you wanted to go there in the first place! But I like the way routes are being linked up. To finish with a so called friend sent me this cartoon. I think she thought it was funny! 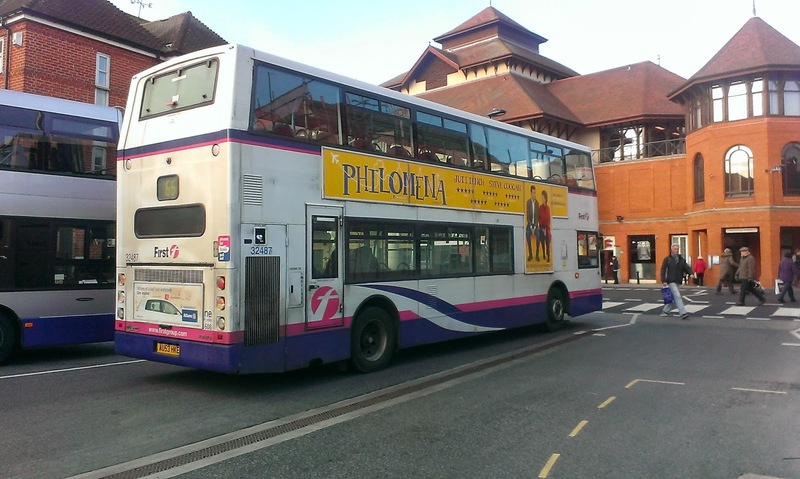 Whilst in Ipswich for the Borismaster I did manage to take some more pics of other random sightings. The sun was making it very difficult to get the angles and light right but I should be thankful it was dry. Anyway let's start with Tower Ramparts Bus Station. Closed for weeks and for what? To reopen looking pretty much the same as it did before. 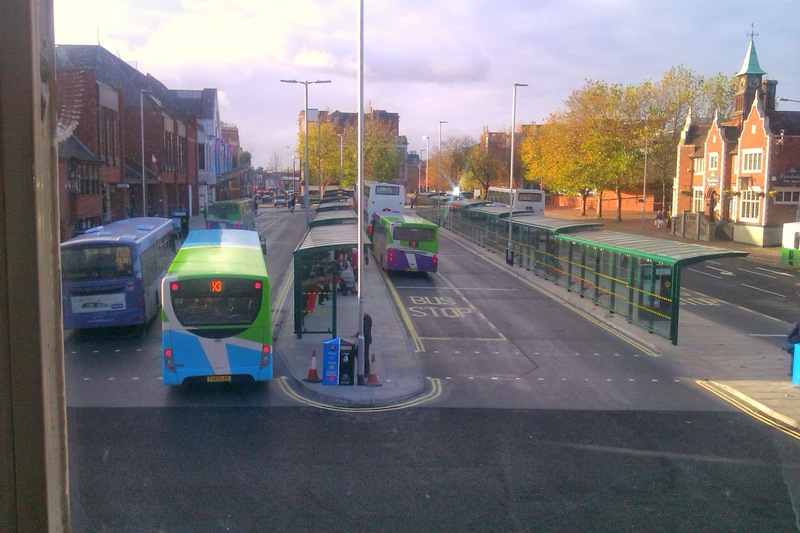 Does it look a modern 21st Century Bus Station? Judge for yourself as I present to you two versions of the same pic. The all new modernised Tower Ramparts Bus Station. They say!! Note the tilting Dart in the centre. So what do you guys think? Waste of money or what!! 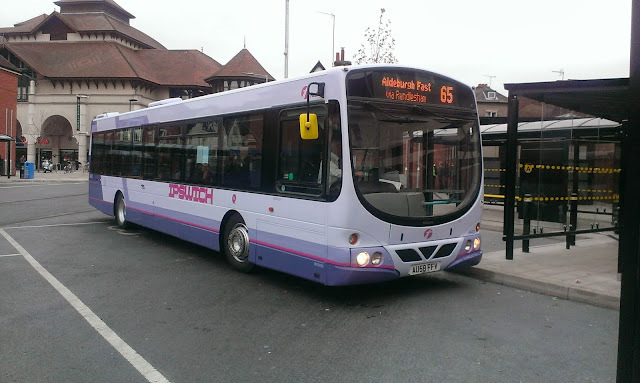 Anyway back to other things and Wirst have started another war with Ipswich Buses by launching their new Service 53 to the until recently unheard of destination of Brookwood, which even I have never heard of. So they are competing with IB's flagship service 13, but not going all the way to Tesco at Copdock, which seems a total fiasco and waste of time. I watched 3 services leave and not a single soul on any of them. Well done Wirst - another winner! 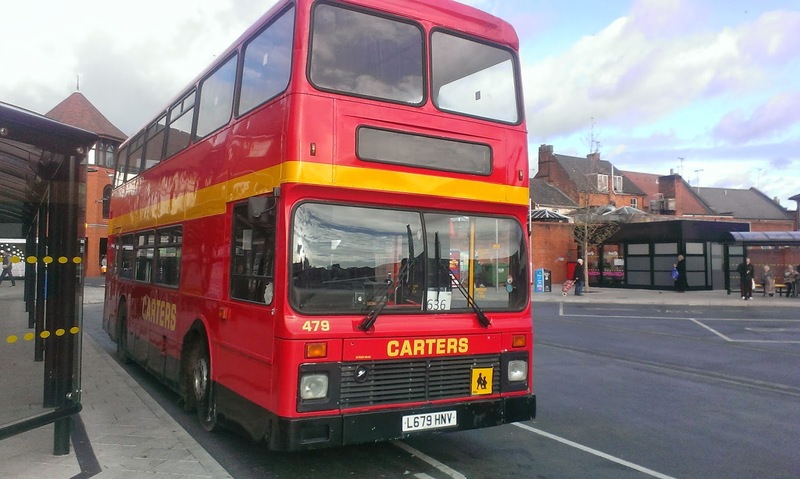 So to Old Cattle Market and quite entertainng as B7tl 32487 AU53 HKE decided to break down on the entrance to the bus station as I arrived. Thankfully my transport both ways, normally operated by 30887 was operated by 32494 - the only decker in the new livery at Ipswich now, and a decent ride both ways it was. I saw that service today with 32492 on it so presume 30887 has indeed gone to Colchester. Ipswich will have no buses left at this rate. Buses, buses everywhere and not a Dart in sight! 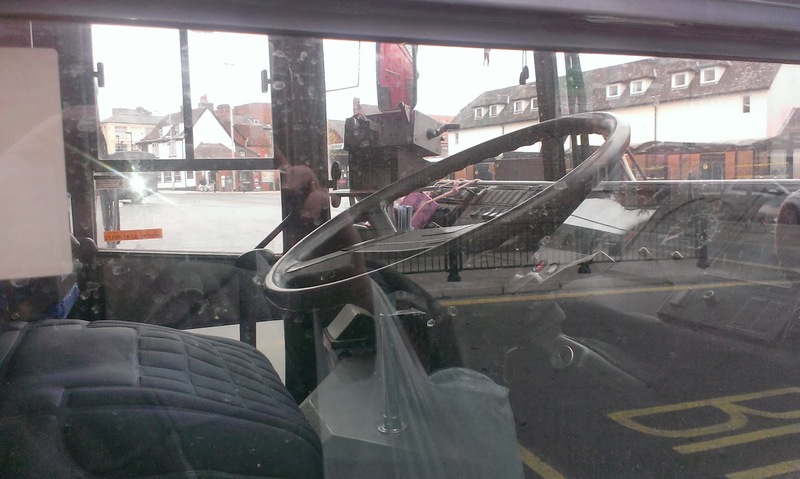 Love Beeston's Scania and observe both Carter's deckers still have roofs!! Just seen a report on a Yahoo group that Ipswich ex P&R Volvo B7rle 69430 AU58 FFS has been seen operating in Colchester over the last couple of days. I never thought for a second that Ipswich would be able to keep all of that batch. 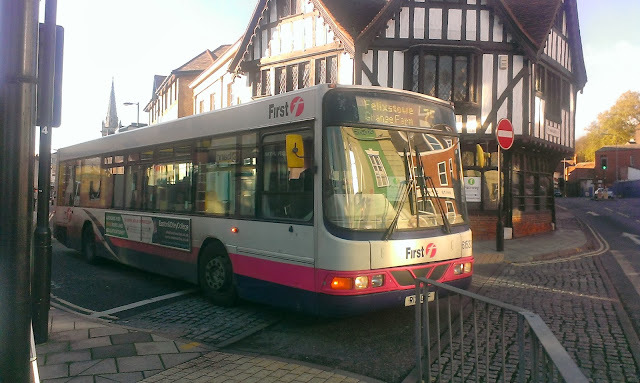 Don't know why First just don't pull out of Ipswich full stop and let a company who actually gives a fig about the place and its passengers take over. Any decent buses we get are taken elsewhere and those we are promised get diverted. They couldn't take 65670 back could they. Oh no!!! Anyone with more info on this please let me know! Rant over. Not two words I normally put next to each other but today is an exception. 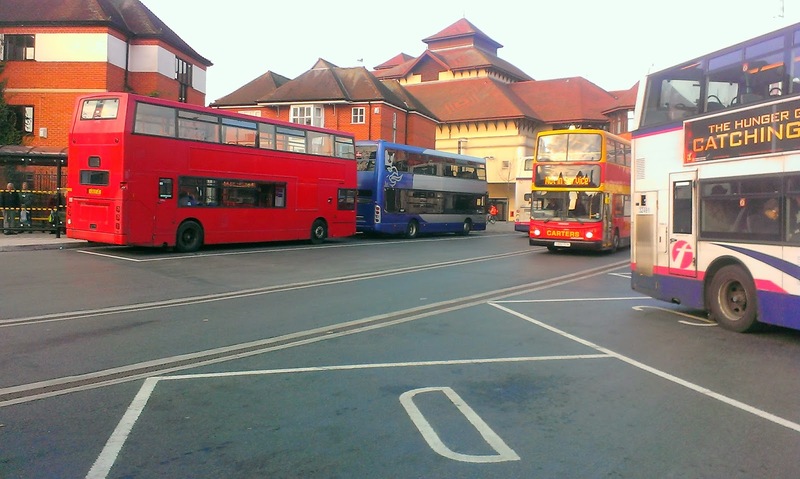 The economy of Ipswich was boosted by a multitude of enthusiasts flocking to see the on loan Borismaster make its debut on Ipswich Free Shuttle. I must commend Ipswich Buses for putting it on that route, as they said as it was a free bus as many people as possible could sample the Borismaster for free. Well played IB. Anyway I spent a very pleasant half hour on LT 100 and it was the first time I had seen the front of the top deck on one of these creations. I love the way it has the 1950's feel yet 21st century comfort. Can't see IB getting any of them but would be awesome if they did. It has long been a bone of contention with me that companies do not consider passenger comfort when choosing seats for their vehicles. Even the seats on the new X1's will come under scrutiny next summer to see how hot they are for passengers wearing shorts after sitting in the Lowestoft sun for half hour. 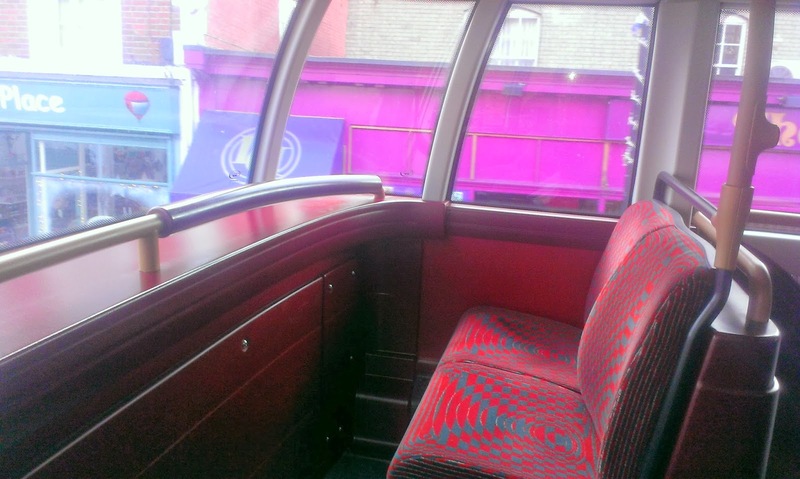 So I thought it might be fun to have a survey as to what you think are the best and worst seats on our buses today. So using the comments section let's see what wins your votes. If you don't want to comment you can email me and I'll add your vote for you. 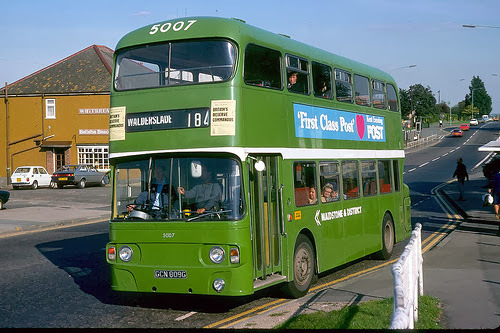 For me the best, or certainly the ones I like the best are on Anglian's gas buses. It is a three way tie for the worst between First's W reg ALX 400's, First's 51 reg Scania Solars (6567*) and Anglian's Omindeckers 550-3. It is possible to have to travel for an hour and a half on any of those for which the companies should have to pay us to endure, not the other way round. Since no one rose to yesterday's challenge I have done some research myself. 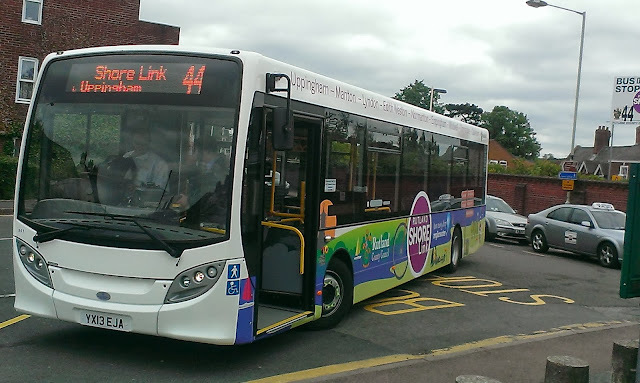 The Shorelink service 44 is operated by Centrebus on behalf of Rutland County Council. The vehicle used is Dennis Enviro 200 YX13 EJA, new in June 2013, reduced to 34 seats to accommodate bikes, and given fleet number 501. As yet I'm not sure which depot she is based at or what used to operate the service. 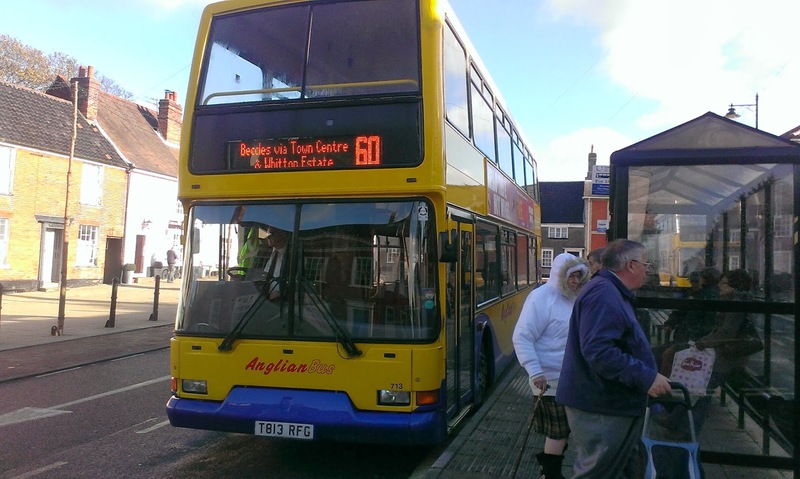 I also found a video promoting the bus on the Rutland Council website, which can be viewed by clicking the link below. Due to my sight probs which mean I find driving after dark almost impossible and not living on a bus route (plus I'm allergic to the cold) the next two or three months are going to clip my wings so to speak. So I will be going through my archives to find things of interest and I'll start today with a challenge to you clever people out there. In the Summer I managed to go from Beccles to Rutland Water and back in a day by bus. 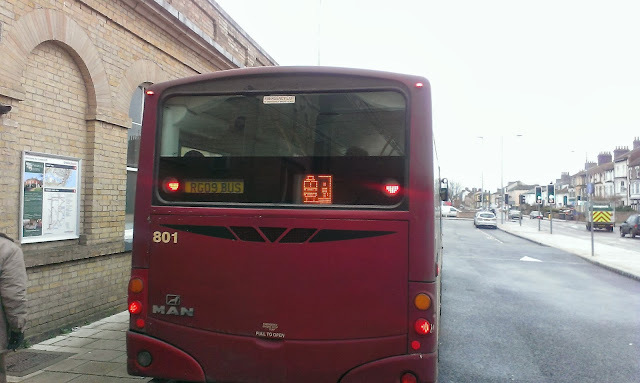 For reasons even I can't work out I only have one picture from that day, but it is of the bus operated by Rutland Council that basically circumnavigates Rutland Water linking to bus and rail services in Oakham, which is where I took this pic. The bus still smelt new when I travelled on it so any info on it and it's operator, and even what it replaced will be gratefully received. Clive Nixon from Ipswich Bus Blog has kindly informed me that Scanias 65550 P550 RNG and 65128 R116 GSF were withdrawn at the weekend. I travelled on 65550 last week and knew it was on borrowed time. A shame that those seats can't be salvaged! 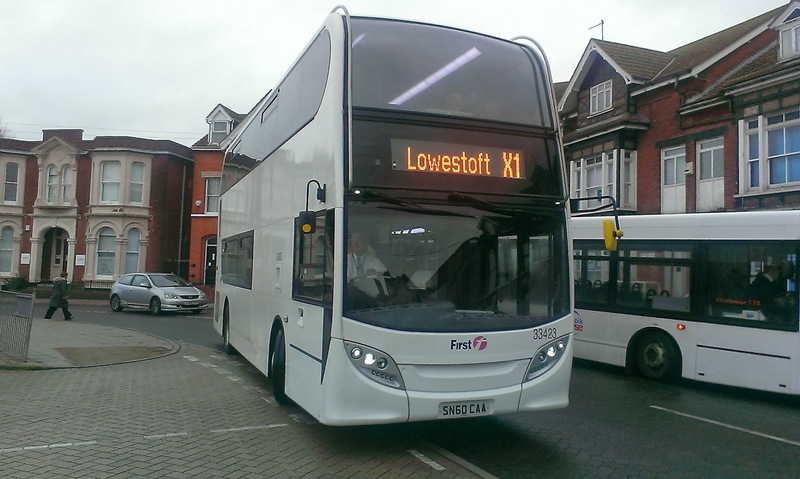 Clive also tells me it has been reported elsewhere that Ipswich are to receive Lowestoft X2 B7's 32655/6 to replace 32652/30887 which are going to Essex. I'll believe it when I see it, personally. Thanks, Clive for the information and for letting me use it. 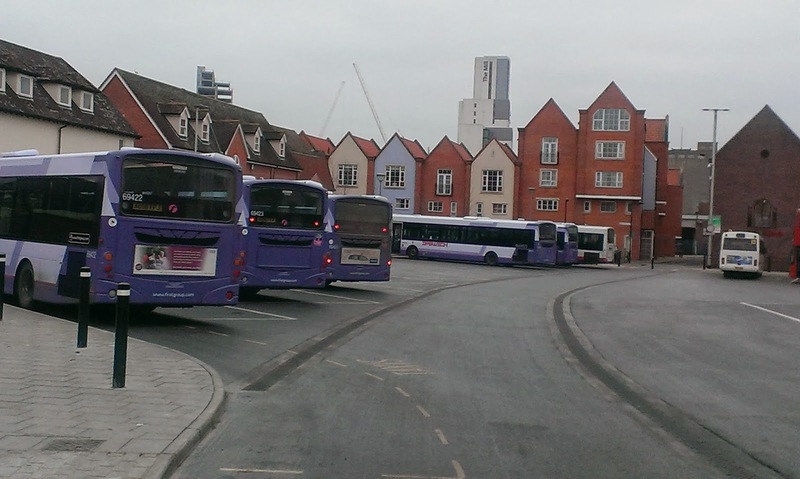 This brings the total number of Scanias withdrawn or transferred from Ipswich in the last fortnight to 8. 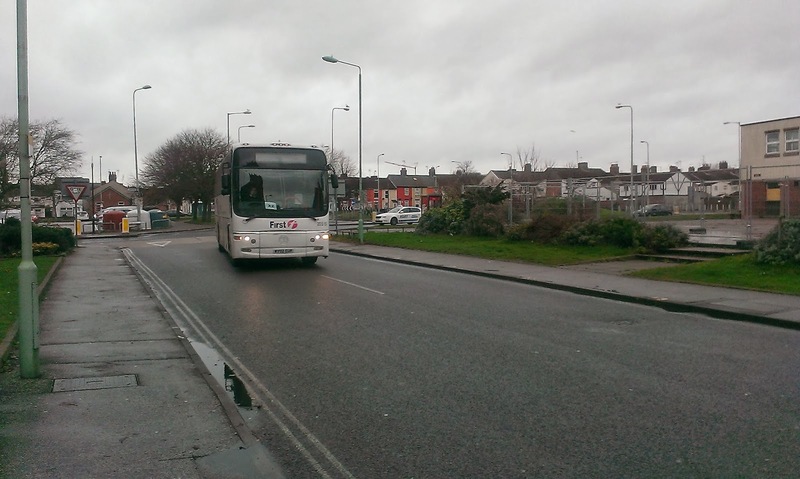 So far 65128/65528/29/40/42/50/65628 have been withdrawn and 65632 has transferred to Clacton and is still in service. 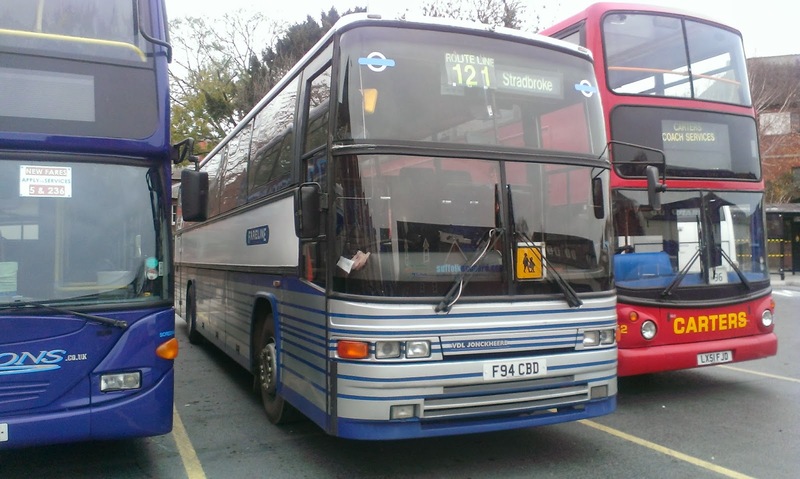 One of the ex Basildon Scanias was also withdrawn after constant engine probs so that now accounts for the 9 ex P&R Volvos. It remains to be seen what else appears at Ipswich over the next few months. As a side note the withdrawal of 65550 means that First Ipswich no longer have any buses with roller blinds - another era ends. After a weekend spent recharging my batteries I decided to check out reports of Anglian now using deckers on the 60 between Beccles and Pleasurewood Hills. Well they are using a right pot pourri of vehicles, which I always like. I caught Trident 713 from Lowestoft to Beccles and a decent ride it gave too. I also saw 712, two unidentified Solos, and either 450 or 451 - which I can't be sure but it was an 07 plated Scania Omnicity! 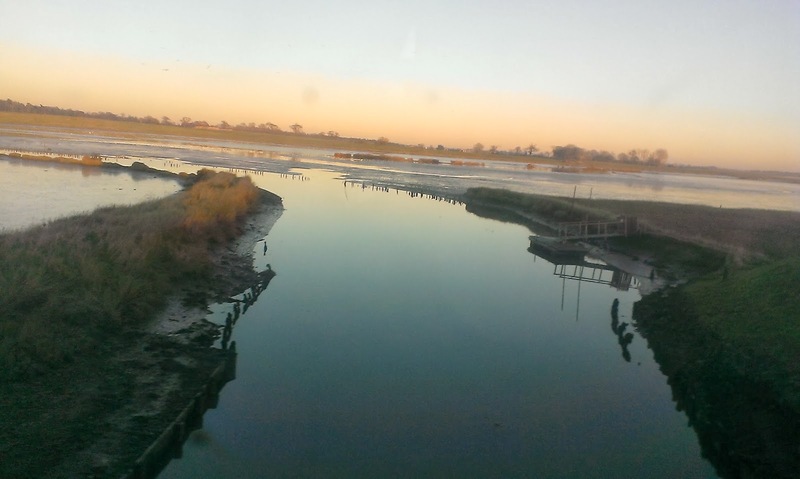 I decided to carry on to Norwich on the X2 but hung around in decidedly cold weather to see what else I could see. The problem with Beccles is that you can't see the buses go in both directins at the same time so I think it may well be a spotting destination for warmer times. After a particularly uncomfortable journey to Norwich on First's Volvo B7tl 30889 W744DWX - whoever decided on those seats never gets on a bus - I had a much nicer return journey on former X1 Volvo B9 37566 AU58 ECE. 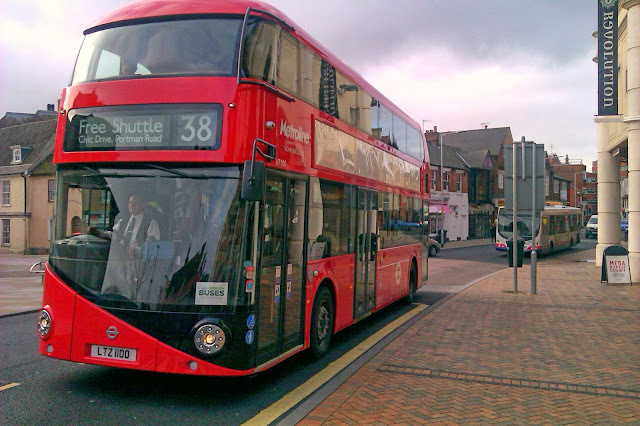 Of all the B9's I've been on so far 566 is by far the best - no rattles, fast and quiet. A shame they are all not quite up to that standard. 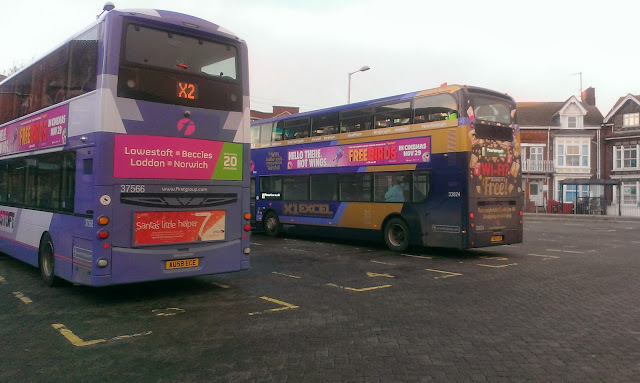 At Lowestoft I got the chance to take a pic of her next to one of her replacements before heading home to some much needed heating!